Murrayfield Racers continued their pursuit of silverware with two impressive performances over the weekend. 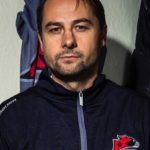 The Racers visited Paisley Pirates in the Scottish National League (SNL) on Saturday aiming to keep up the pressure at the top of the table. Tony Hand’s side came out the blocks quickly, with goals by Sean Donaldson and Michael Ireland putting them 2-0 in front inside the first 12 minutes. Aaron Robertson extended the lead early in the second session, before Martyn Guy finally got the home side on the scoresheet in the 30th minute. 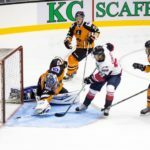 Richard Thorp quickly added another for the Pirates, but Callum Boyd soon restored the two-goal advantage to settle the Racers’ nerves. Daniel Abercrombie bagged a consolation goal for Paisley in the final minute, but the visitors saw out the remaining time to secure a deserved 4-3 victory. The result leaves the Racers two points off top spot with two games in hand. 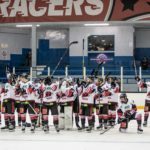 The Racers returned to home ice the following day to face Kirkcaldy Kestrels in the first leg of their Scottish Cup semi-final tie. Racers dominated the first period, but they only had Joel Gautschi’s 16th minute goal to show for their efforts. However, they pulled away in the middle session with further goals by Gautschi, Ross Borwick and Michael Ireland putting them in control of the tie. Sean Donaldson added a fifth after 48 minutes and Gautschi completed his hat-trick with 25 seconds remaining to complete a 6-0 success. 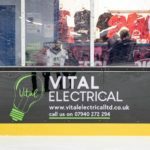 The two sides will meet again in the second leg at Fife Ice Arena on Saturday, 9th March. The Racers are back in league action on Saturday, 9th February, when they travel to face reigning champions Dundee Comets. We are considering running a bus to what promises to be a thrilling encounter. Cost would be £20 per person (travel only) and set-off time around 4.00pm (TBC). Please register your interest to tickets@mracers.com.